Home » Spinach Ice Cream?? The spinach will be our little secret; I swear you cannot taste it at all! It’s an ice-cream version of a recipe posted a few weeks ago. Finally the weather’s getting warmer. When I discovered that the temperature was a perfect 74 degrees, I decided to celebrate: with ice cream. Taking advantage of the waning spring-break hours, I invited two friends over to eat ice cream on the patio. 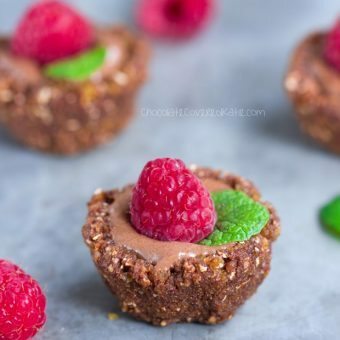 One of my Raw Dessert Recipes. Blend everything together in the Vita-Mix. (If you don’t have a high-powered blender, just add more liquid; it won’t be as ice-cream-like, but it’ll still taste good!) 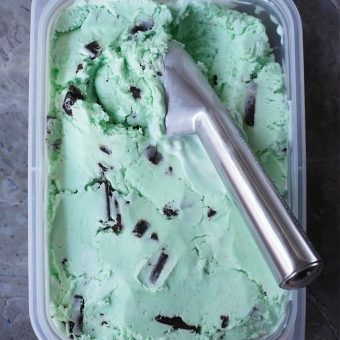 Use an ice-cream scoop for authentic-looking ice cream. Not a fan of spinach? 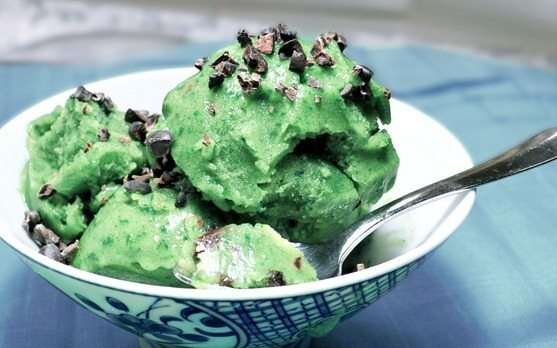 If you prefer, try this recipe for real Healthy Mint-Chip Ice Cream. After my friends left, I continued the St. Patrick’s Day theme (and the leafy-green theme) with dinner. 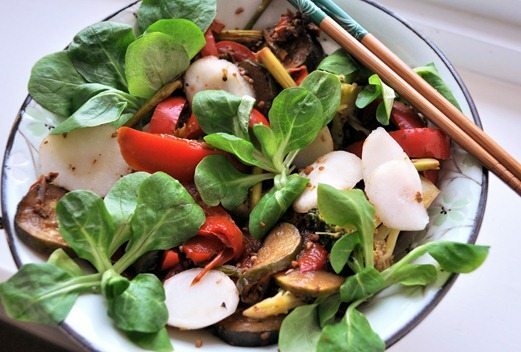 It’s just a simple stir-fry over bulgur. But the mache greens look like four-leaf clovers! I also ate a spoonful of raw cashew butter, straight-up. Anyone else like eating nut butters straight-up? How do you get your daily servings of leafy greens? And thanks for all the feedback about My FAQ Page. 10 Healthy Ice Cream Recipes! Previous Post: « Vegan Greek Yogurt… in stores! I eat a lorra lorra green smoothies – I say eat, not drink, cos they are soo thick 😛 best way to do it IMHO! Whoa, fun idea for the spinach! Spinach icecream… now that is impressive hah. I love eating nut butters straight up, if I could only live off one food for the rest of my live it would be peanut butter! its actually SO GOOD when i find ways to sneak leafy stuff in my food- i LOVE veggies but i aint a HUGE fan of leaves! The color is beautiful! I am loving on spinach lately in and on everything! Yesterday Annika and I made roasted hazelnut butter in the food processor – yum! Totally worth eating straight-up! As for getting in my daily greens, I like to toss some kale in whatever soup I’m making. It is mild enough that I can usually get it past the kid and husband without too much complaint. Why have I never added spinach to my banana soft serve! I get tonsss of leafy greens via green smoothies and salads. But I could never say no to this ice cream! this looks so good! LOVE it! I love you and your yummy recipes!!! I eat greens in salads and stir-fries, but I also like to add a handful to smoothies — why not? I can’t taste them and it is so easy to do. I love how GREEN that ice cream is! All of the above! I love my greens in smoothies, salads, soups, stir fries, steamed however I love them! 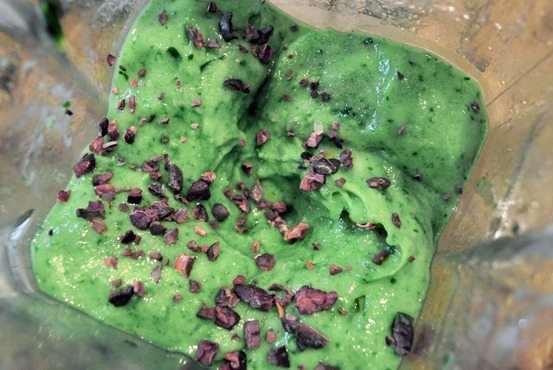 That mint ice cream looks great – a good natural food colouring would be some spirulina! I’ve never tried spirulina! I’ll have to look for it! That’s the plus…on the minus side, it has a *very* strong flavour. It’s completely vegan…but it tastes like fish food, bleugh. Not too surprising, considering it’s the main ingredient in most…fish food. I used to gulp down my daily dose of spirulina powder mixed with water and sweetener, whilst holding my nose tightly, then immediately grab a toothpaste laden brush and go crazy (tongue included). Would follow with an (unhealthy) diet coke just to get rid of any aftertaste burning through the toothpaste. It’s *that* strong…so not sure what it would be like in a recipe. The health benefits are too good to miss, so now I take the weaker but less hard-work tablet form. I also want to thank you for the recommendation of the Nu-Naturals vanilla stevia drops. I’d given up on finding a stevia that I could stand, but with your rave review, I decided to give it one more go, and I’m so glad I did! OK, one last thing – sorry to be long-winded! My 6 and 4 year olds think spinach smoothies and spinach ice cream are the best desserts ever. Smoothies are definitely our delivery-method of choice for greens around here. And if you’re ever out of mint extract, you can always just put fresh mint in with the spinach for even more green goodness. We like it both ways, and the fresh mint is free from the garden so we often go that route. Thanks again. We all love you around here! Oh wow, Tina, your comment made me smile SO SO much! And wow, you must have super-smart children to love spinach smoothies already. Can they come teach my mom? I have to put the smoothie in a dark glass for her to drink it, because she just cannot get over the green! I have question what kind of peppermint exctract do you use? I just use McCormick pure peppermint. Make sure it says “pure” though, not imitation :). Woah, that sounds hilarious! I know there’s also a festival (in TN?) where they make garlic ice cream! Wow! I want that ice cream now! It looks delicious. Wow this is a totally genius idea. I am in awe. I can’t wait till I have kids one day and can trick them with all sorts of healthy treats like this! Haha!